When you live here on earth, you have to admit that you are on earth and that no where on earth is a paradise. You have to work, earn money to live and pay your bills. It is only in heaven that the scripture says everything is easy and enjoyment without pains. It isn't that there is no enjoyment on earth, but the pain on earth almost wipes out the enjoyable part. Imagine the fate of earth citizens managing unexpected troubles and calamities, such as the world has witnessed in Texas, Sierra Leone, Tsunami and earthquakes that have shaken the world beyond human imagination. It is partly for the reason to avoid such experiences and the pain from them that makes human draw to a higher power for protection and comfort - in times of pain. Therefore, it was not unexpected that President Donald Trump decidedly declared this Sunday as National Day of Prayer as a way of reducing the pain from the Texas' experience. Many people in Houston are in pain. Many people have lost all they have worked for over the years. Many of the flood victims, reports says, don't have flood insurance. 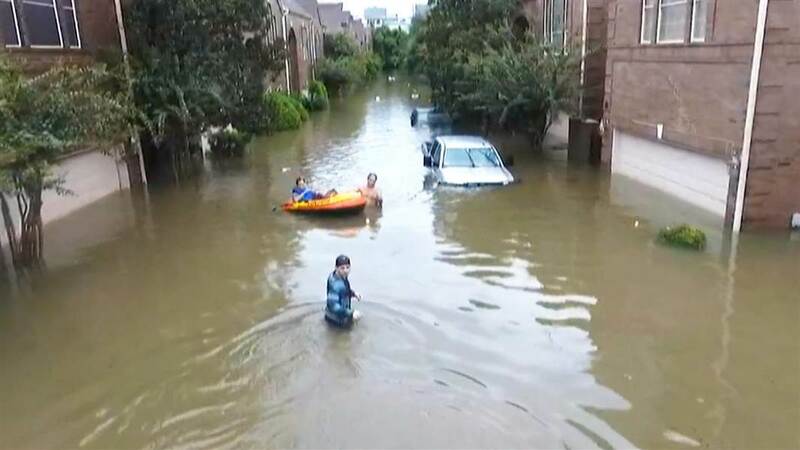 Though, they don't have flood insurance, but they will be thanking God in their hearts for being alive, in circumstances that have resorted to loss of lives. When one has lost everything and he or she is lucky to be alive, one has only God to look up to for relief. Many of the people lost to Harvey have relations left behind in need of relief. Imagine the young girl found alive on top of her dead mother. There may be many other cases like her case but unreported. Factly, we are all victims in the Texas' tragedy. White, Black, Mulatto, Spanish, English, French, Liberals and Conservatives. Public spirited individuals are being called upon to open their wallets for their widow's mite, because it is perceived that the Texas' recovery package is beyond what should be left for government alone to shoulder. It is time to seek God's intervention. We are all God's children, irrespective of difference in religion and culture. There is no country on earth that claims to belong to the devil. When the journey becomes tough, it is to God that we look up to for the strength to arrive at destination. Tragedy is not a preserve of any particular country or people. It can happen anywhere. The world had witnessed Tsunami, earthquakes of serious magnitude in countries far away from the U.S. The U.S had its own Hurricane Katrina and Hurricane Sandy's nightmarish experiences. But people have unanimously described Hurricane Harvey as more destructive than Katrina and Sandy put together. No one wants a repeat of Katrina, Sandy and Harvey. They are monsters and only seek to destroy. Aside for the relief that victims of Harvey requires and prayers for God to enable people come forward and give helping hands, Americans need prayers to address the scourge of hurricanes and tornados, coming to turn people's lives upside down. The political situation in the country also requires prayers to take Russia out of the context and for the Liberals and conservatives to begin to work together for the good of the ordinary people, without consideration first for ideological and selfish agenda. And for power to be restored back to parents over their children and husbands over their wives.